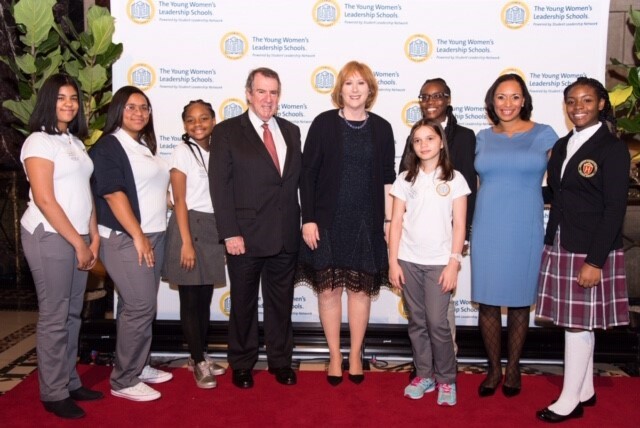 October 17, 2018, New York, New York — Yesterday, Student Leadership Network (SL Network) produced their annual (Em)Power Breakfast, a gathering of 700 guests to celebrate more than 2,500 girls who are impacted by The Young Women’s Leadership Schools (TYWLS) in New York City. The event honors the organization’s students and their achievements, as well as business and philanthropic leaders for their commitment to breaking the cycle of poverty through equalizing education. Ayana Gilbert, a 9th grade student at TYWLS of East Harlem, opened the program with her original poem “What is Beautiful.” Following, Founder and President Ann Tisch welcomed guests to the event and urged the crowd to continue to support girls’ education and Student Leadership Network’s mission to empower a diverse pipeline of young people, by providing them with access to educational opportunities that prepare them to become global change agents. Executive Director, Jemina Bernard, announced the organization’s official name change from Young Women’s Leadership Network to Student Leadership Network. She then introduced students from several affiliates from around the country, including the schools in Baltimore, MD; Chicago, IL; St. Louis, MO; Wilmington, NC; and Rochester, NY to walk the stage and introduce themselves to the audience. Laura Rebell Gross, head of Girls’ Education at the organization, highlighted the stellar work and support her team provides to the schools in New York City and nationwide. Since 2001, TYWLS has helped garner more than $123 M in scholarships and financial aid for students going to college, and nearly 100% of students graduate each year. TYWLS students graduate from college at nearly four times the rate of their peers. Sophia Fiallo served as the student emcee for the event and shared her personal experience attending TWYLS and how it has changed her life for the better. “The (Em)Power event gives us the chance to showcase our amazing young women. They often share their compelling stories about their families, their struggles, and their victories. I don’t want anyone to ever forget how accomplished and driven our students are,” says Ann Tisch.